Those of you who rely on a live RSS bookmark of the headlines from Chipwrapper might have found the last couple of weeks to be slow news weeks. In fact, for some of the time, it even appeared to be a no news week, as the main RSS feed failed. What appears to have happened is that the main Yahoo! Pipe feeding the service started generating an error message, instead of providing the expected mash-up of newspaper headlines. I've no real understanding of why, but I've noticed that both the Daily Express and Daily Mail RSS feeds have been throwing out all manner of nasty character encodings over the last couple of weeks, so maybe some combination of the two threw it out. In fact, some of the strange characters that the Mail were publishing were leaking out as 'question marks' on their own homepage as well. Anyway, I've partially rebuilt the system as a result, and hopefully it is a little bit more resilient now. The Chipwrapper RSS feed, headline aggregation on the homepage, and mobile site should all be working again, whatever ugly XML the newspapers try to throw at it. I've also slightly reconfigured the services appearing in the headline feed. I know that Channel 4 have been thinking very hard about their online news service, and so I have now included them in the feed as one of the UK's TV news sources, alongside the BBC, ITN and Sky. 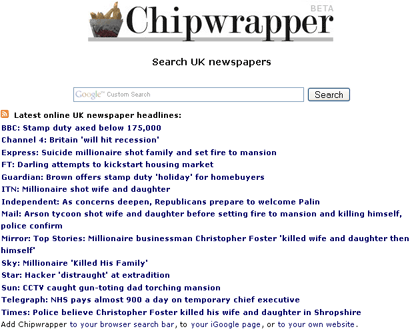 It further dilutes the premise of Chipwrapper being a newspaper aggregator of course, but I find it handy to have all my UK headlines in one place, print edition or no print edition. I would have included Five News with Natasha as well, but their site, built by Not Only But Also, with news sourced from Sky, doesn't seem to have an RSS feed. I've also added the Daily Star into the weekday mix, and made some changes to the Sunday line-up. Inexplicably, the latest News Of The World website design seems to have gone a bit web-retro and abolished RSS feeds, so the 'Chipwrapper on a Sunday' line-up has been pared down slightly. The Observer's content should now correctly appear as being from The Observer, rather than from The Guardian though. By Martin Belam on 8 September 2008.